Fleet Week is always a big deal in San Francisco, but just like other military showcases these days it seems somewhat tame compared to years past. 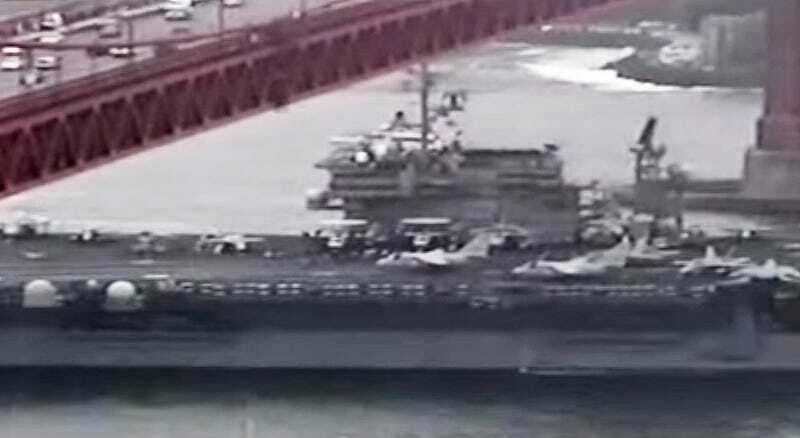 Case in point, this awesome video of the USS Constellation triumphantly rippling off jets from her deck catapults just as she passes under the iconic Golden Gate bridge in 2000. The Connie’s grand arrival at Fleet Week can be seen again in this video, the Tomcat’s launch at the end is especially awesome. This instance 15 years ago doesn’t seem to be the first time, or the last that launches have been executed from carriers while in San Francisco Bay. In fact, here is another video, which appears to be a Nimitz Class carrier also firing jets off its deck while in San Francisco Bay. And the video below, taken in 2006 aboard the USS Nimitz, shows a Super Hornet performing a touch-and-go on the carrier’s deck. You can see all the landmarks in the distance, including the Golden Gate Bridge and Alcatraz Island. San Francisco has one of the richest naval histories of any city in America. Aircraft carriers especially have deep roots in the Bay Area. Carriers were fixtures at Naval Base Alameda for many decades. During the later half the of the Cold War, both conventional and nuclear aircraft carriers were based there, including the Iconic USS Enterprise and USS Ranger. The base closed in 1997 as the U.S. continued to consolidate its forces as part of the so-called “peace dividend.” Today the USS Hornet, which has been turned into a museum ship, stands as a testament to the past. Who knows if we will ever see anything like this again? Supposedly Harriers have launched off the decks of their Navy Landing Helicopter Dock motherships during recent Fleet Weeks, maybe they will do the same with F-35Bs in the future. As for the big supercarriers, who knows.